The discount offer on above cannot be used in conjunction with other promotions and / or be exchanged for cash. Participants must be able to fit into the harness securely for the activity. Written parental authorisation is required for clients under 18 years old. Staff must be informed if you have the following: high blood pressure, heart conditions, diabetes, pregnancy, neurological disorders, epilepsy, previous dislocations, recent sprains, fragile skin, artificial limbs, asthma and other medical conditions you may have. AJ Hackett Macau Tower reserves the right of all final decisions. Bookings are essential. To book in advance, please visit AJ Hackett’s or email [email protected] 24 hours before your visit. Same day booking is only available through AJ Hackett’s hotline. Please have your iVenture Card ready when purchasing the ticket. No refunds are allowed after booking, registration and payment. Take a walk on the wild side with your family and friends in the Skywalk. Using an overhead rail system, you can walk around the outer rim of the Macau Tower without any handrails and truly conquer your fear of heights! 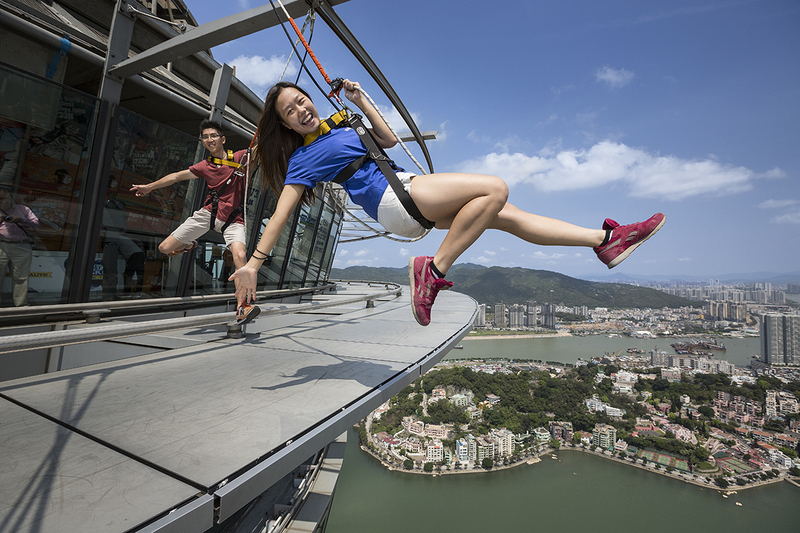 Take in the best views of Macau and take home photos of yourselves hanging out on the edge. The Skywalk at the Macau Tower allows people of all ages to enjoy a fun stroll around it. People as young as 2 years and as old as 94 years have tried out this thrilling experience. It also has no weight restriction as long as you can fit the harnesses provided. The Skywalk is open daily as the weather permits. Have a great time taking photos as the package includes a USB of your photos during the stroll. Please also let the staff know if you are celebrating your birthday before the activity.